Share price dropped shortly after trading opened. 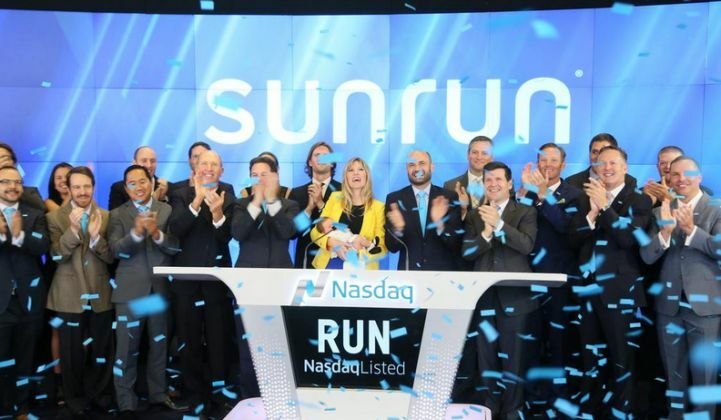 Sunrun rang the bell at the Nasdaq stock exchange today, with its initial public offering priced at $14 per share under the symbol RUN. The San Francisco-based residential solar company raised nearly $251 million by selling 17.9 million shares, for an initial market cap of around $1.36 billion. Trading opened Wednesday morning on the lower scale of Sunrun’s target range at $13.06 per share. The company was expected to IPO between $13 and $15. Sunrun is the second-largest residential solar company in the U.S. with approximately 79,000 solar customers across 13 states. SolarCity, the largest U.S. residential solar installer, has about 250,000 customers and a market cap of $5.67 billion. Sunrun CEO Lynn Jurich, who attended the IPO with her newborn baby, told Greentech Media last year that her company’s channel model, which mixes its own installer fleet with those of other installer partners, is thriving. 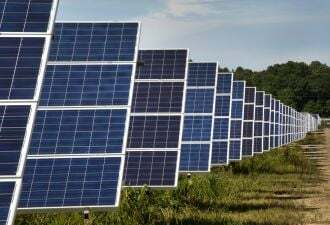 Pfund agreed that smaller regional private companies will always play a role in the solar industry, but added that it’s also important for national brands to emerge and join the major players in the energy industry. And in the case of coal, even replace some of those players. Credit Suisse, Goldman Sachs & Co. and Morgan Stanley are acting as the lead underwriters of the IPO, which was first announced in June. Sunrun’s revenue nearly quadrupled last year to $198.5 million, but the company also reported a doubling in losses, totaling $162.5 million. Sunrun has raised roughly $681 million since it was founded in 2007. VC investors with significant ownership of Sunrun pre-IPO include Foundation Capital, Accel Partners, Canyon Partners, Sequoia Capital and Madrone Partners. The IPO comes as the Obama administration has just released the final version of the Clean Power Plan, a carbon-cutting regulation that is expected to boost the deployment of renewable energy. Under the rule, states are required to submit plans for cutting carbon by 2018 and must start achieving reductions by 2022. Overall, the U.S. EPA expects the Clean Power Plan to reduce greenhouse gas emissions by 32 percent by 2030. 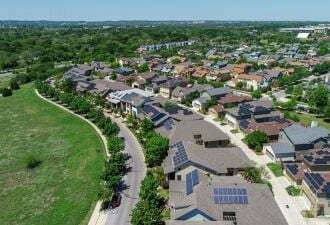 While the target represents a big opportunity for clean energy companies, the timelines are too far out to have an immediate impact on the rapidly evolving residential solar industry, according to Shayle Kann, vice president of GTM Research. Sunrun’s $14 IPO price is the latest indication that the market will continue to expand in the near term. “The IPO price in middle of the range is a signal that investors continue to have appetite for distributed solar companies in the U.S., and that we can expect to see continued growth in the sector,” said Kann.